Come fly with us to Neverland! Peter Pan is the charming story about the boy who wouldn’t grow up. Pirates, Indians, Lost Boys, and Faeries. Come see why we named our company after the birthplace of this extraordinary boy! Toni Butler will direct this production. Why the British version? 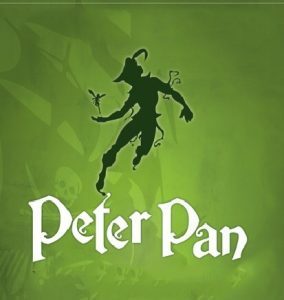 We know and love Peter Pan and this musical is the most loyal version we have found to James M. Barrie’s original play and the music is more energetic and current. We love this version and are sure you will too! Congratulations to the new cast of PETER PAN! This is going to be an awfully big adventure! First Mandatory Cast Meeting: You will have a mandatory cast meeting on April 22 from 7-8p (if you are under 18, a parent/guardian needs to be there with you.) . There will be a read-through from 8-10p after the meeting for those with lines. Rehearsals: Rehearsals will begin April 22. Generally rehearsals are M-TH from 6-10p and Saturday from 8a-5p. We will not rehearse May 24-27, May 30-31, and June 3-4. The first week’s rehearsals is posted below. Performances: June 14, 15, 17, 21, 22 and 24, 2019 at 7p. Please double check, some names are listed more than once.